Images have become the mainstay of our experience of historical events and occasionally people have felt the need to manipulate those images to support their views or manipulate the truth. Since the advent of the Internet, we are now also seeing a large number of “photoshopped” images created for humor or popularity. This is a list of 15 of the most famous manipulated images. These images are shown in no particular order. Click images for a larger view. Forge your own awesome creations with Adobe Photoshop Elements at Amazon.com! 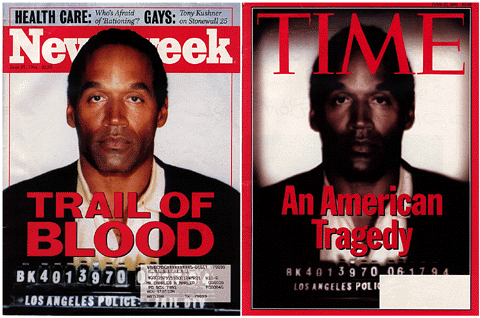 In the summer of 1994, O.J. Simpson was arrested for the murders of his ex-wife Nicole Smith and her friend. News publications were plastering his mugshot everywhere as it was turning out to be the trial of the Century. Notably, TIME Magazine published an edition featuring an altered mugshot, removing the photograph’s color saturation (which some accused of making Simpson’s skin darker), burning the corners, and reducing the size of the prisoner ID number. This appeared on newsstands right next to an unaltered picture by Newsweek. 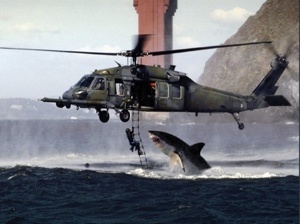 Helicopter Shark is a composition of two photographs that gives the impression that a Great white shark is leaping out of the water attacking military personnel climbing a suspended ladder attached to a special forces UH-60 Black Hawk helicopter. The photo was widely circulated via email in 2001, along with a claim that it had been chosen as “National Geographic Photo of the Year”. The final edited photo was created by combining a photograph of a HH-60G Pave Hawk helicopter taken by Lance Cheung for United States Air Force (USAF), and a photo taken by South African photographer Charles Maxwell. While the helicopter photo was in fact taken in front of the Golden Gate Bridge, the photo of the shark was actually taken in False Bay, South Africa. There are no known sightings of Great White sharks in San Francisco Bay. Soon after Sept 11th, 2001, this picture was clogging everyone’s e-mails. 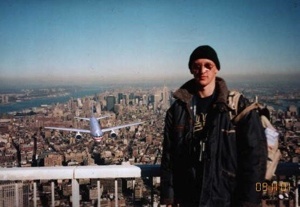 It is supposed to be the last picture taken on a roll of film from a camera that somehow managed to survive the decimation of everything in the Twin Towers. It was soon to be found as an altered image. Firstly, the weather on the image did not match the real weather on September 11th, 2001. 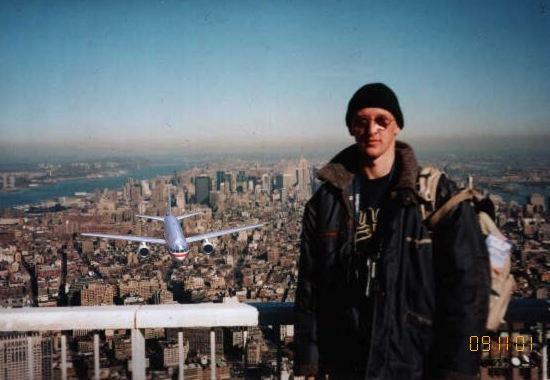 Secondly, he is standing on the south tower, but the first tower to be hit was the north tower. Thirdly, the observation deck of the WTC was not open when the planes hit. Fourth, the aircraft that struck the WTC were traveling at such a velocity that only an extremely fast shutter speed would have rendered the amount of detail on the aircraft pictured. 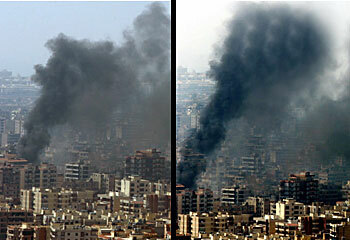 Finally, the plane on the picture is an American Boeing 757, while the planes that hit the WTC were Boeing 767s. The altered image (left) was part of George Bush’s political campaign in 2004. He is digitally taken out by copying and pasting existing soldiers over the podium. Later, campaign managers would admit to the altering of the image. The Bush campaign corrected and re-shipped the campaign to TV stations. In 2004, an Anti-Kerry campaign was run to tarnish his name. This picture shows Kerry associating with Jane Fonda a vilified anti-war protester. The picture was mocked up to look like a news clipping from the ‘70s. 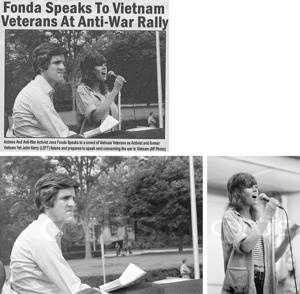 The composite of two different images were of Kerry taken on June 13, 1971 and of Jane Fonda taken in August, 1972. This image was of an entry in a photoshop contest on popular site Fark.com. 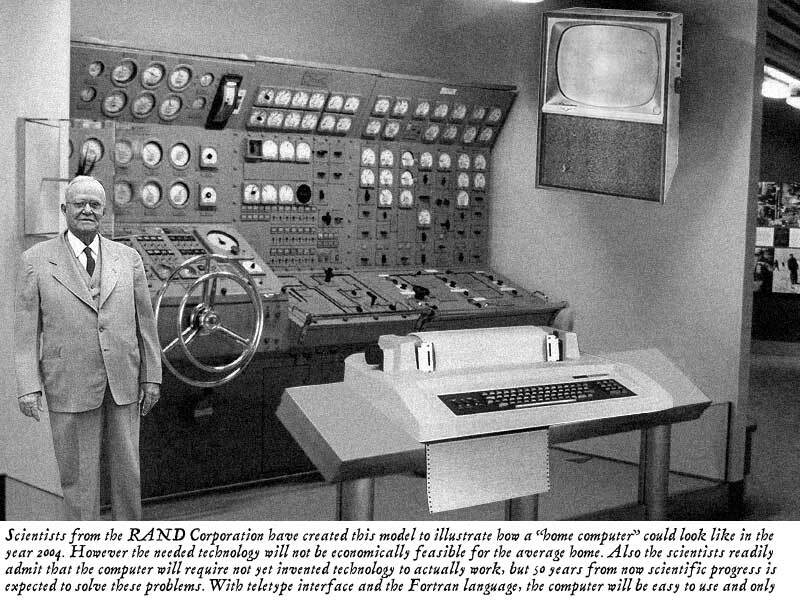 The “theme” was of a picture of a submarine control panel mockup. He did such a job on the image that before the contest ended, it was already spread around the internet on bulletin boards and in emails. This caused Snopes.com (myth debunking site) to write up an article. After the snopes article, the photgraph won the contest. The image continued to confuse people from Sept. 2004-March of 2006 including newspapers like the San Luis Obispo Tribune who credited Popular Mechanics and TV and radio personalities such as “Bob and Tom”. Capture the best moments with a Sony DSC-RX100M III Cyber-shot Digital Still Camera at Amazon.com! In 2006, when Katie Couric announced she would be replacing Dan Rather permanently on CBS evening news, marketing was pushed forward. The picture on the right became her “official image”. 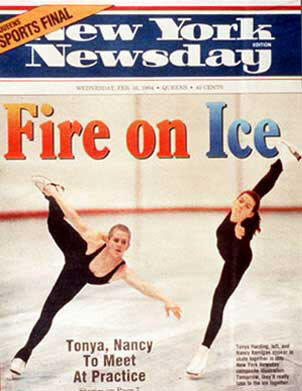 A CBS photo specialist shaped Miss Couric from the original on the left. Miss Couric’s remarks were “I liked the first picture better because there’s more of me to love”. The picture above was taken by L.Y. Leonidov on Nov 7, 1919 as the Soviet Union was celebrating the second anniversary of the October Revolution. In the centre is Lenin with his trade mark goatee and wearing a Soviet cap. Two people over to Lenin’s left is Trotsky wearing glasses and giving a salute. At this time Trotsky was a still a powerful figure in Russia and held the powerful chairman of the Supreme Military Council position. In 1967 in time for the V.I. Lenin in the Art of Photography, in Moscow, Trotsky and three others (Kamenev, Khalatov, and unknown) were airbrushed out of the photo. 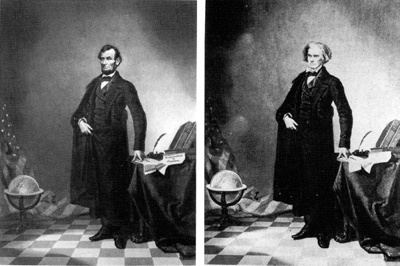 This nearly iconic portrait of U.S. President Abraham Lincoln is a composite of Lincoln’s head and the Southern politician John Calhoun’s body. Putting the date of this image into context, note that the first permanent photographic image was created in 1826 and the Eastman Dry Plate Company (later to become Eastman Kodak) was created in 1881. Stalin routinely air-brushed his enemies out of photographs. In this photograph a commissar (Nikolai Ivanovich Yezhov) was removed from the original photograph after falling out of favor with Stalin. This Pulitzer Prize winning photo by John Filo shows Mary Ann Vecchio screaming as she kneels over the body of student Jeffrey Miller at Kent State University, where National Guardsmen had fired into a crowd of demonstrators, killing four and wounding nine. The original photograph shows a fence post directly behind Vecchio, that was removed in the published version. In this National Geographic magazine cover story on Egypt, the Great Pyramids of Giza, in a horizontal picture by Gordon Gahen, were “squeezed” together to fit the magazine’s vertical format. 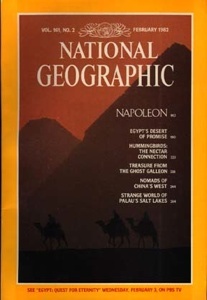 Tom Kennedy, who became the director of photography at National Geographic after the cover was manipulated, stated that “We no longer use that technology to manipulate elements in a photo simply to achieve a more compelling graphic effect. We regarded that afterwards as a mistake, and we wouldn’t repeat that mistake today”. 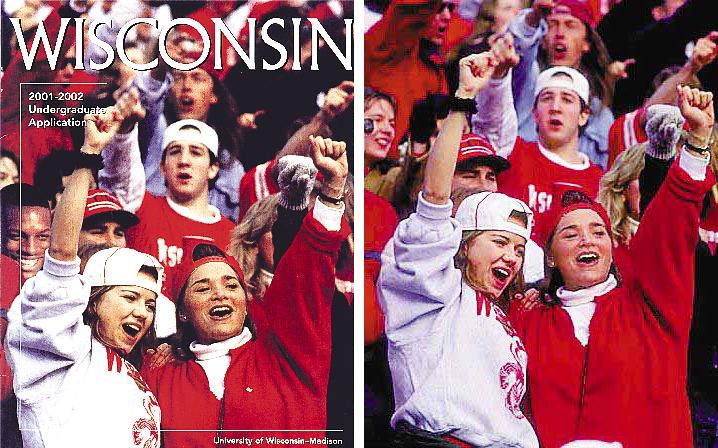 Hoping to illustrate its diverse enrollment, the University of Wisconsin at Madison doctored a photograph on a brochure cover by digitally inserting a black student in a crowd of white football fans. The original photograph of white fans was taken in 1993. The additional black student, senior Diallo Shabazz, was taken in 1994. University officials said that they spent the summer looking for pictures that would show the school’s diversity — but had no luck.